Visit often as we upload information and pix from our 20+ highlighted sustainable gardens. We'll kick off the 2018 Mar Vista Green Garden Showcase at 10am with 11th district Councilmember Mike Bonin welcoming visitors at The Learning Garden at Venice High School. 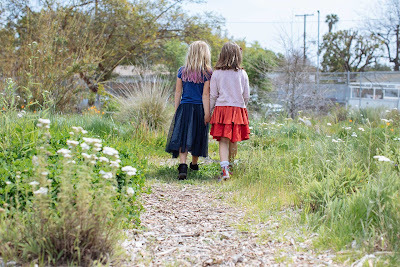 The Learning Garden was the first school garden started by community activists, setting the model for many of the other school gardens in the Mar Vista area. Attaching their endeavors to the existing gardening classes at Venice High School, The Learning Garden has been a beacon for the community since 2002. Great place to start your tour. Tour this enormous peaceful and sustainable garden and learn about what David King does for the community. Then pick up a map and figure out your route for the day, apply your sunscreen, talk to experts and meet lots of garden lovers. 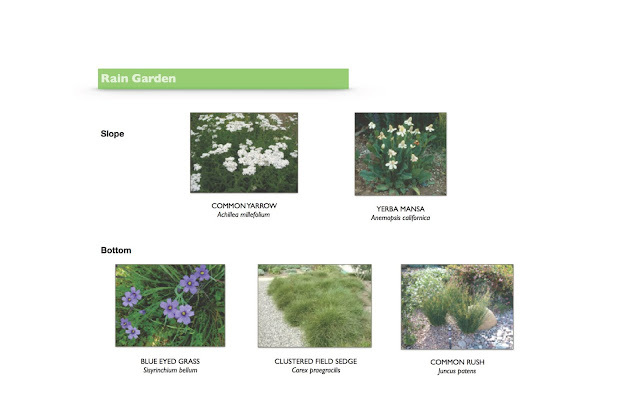 The entirety of The Learning Garden is grown without any pesticides, herbicides or fertilizer and depends on the soil food web to provide the plants with the appropriate nutrients. The garden is watered by hand; as a teaching institution, part of learning how to care for plants is watering them. Some passive water saving is employed, capturing runoff and sequestering it back into the aquifer. The gardens are well mulched. There are three or four (depending on the week) different ways of composting in the garden. You'll also be able to dig deep into the expertise from the Seed Library of LA (SLOLA), the local organization protecting the diversity of our food supply. 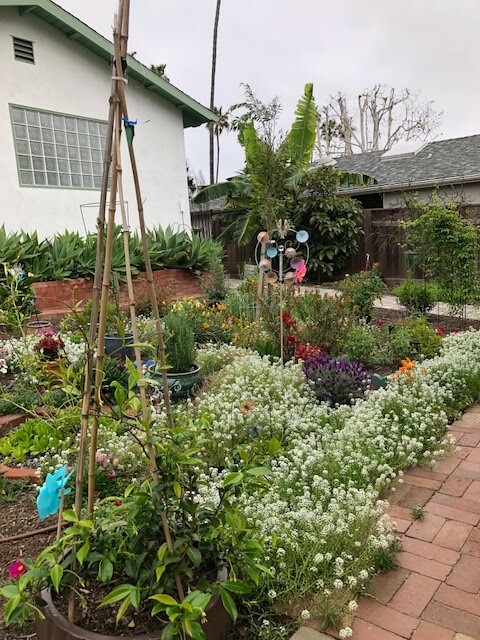 SLOLA is a collection of seeds and a community of passionate gardeners and volunteers, which facilitates the growth of open-pollinated seeds among residents of the Los Angeles Basin. A hub and repository for seed collection, SLOLA's mission is to educate members about the practice of seed-saving through their free monthly workshop and outreach events, such as MVGGS. Please note that you enter through the gate on Walgrove just south of Venice Blvd. 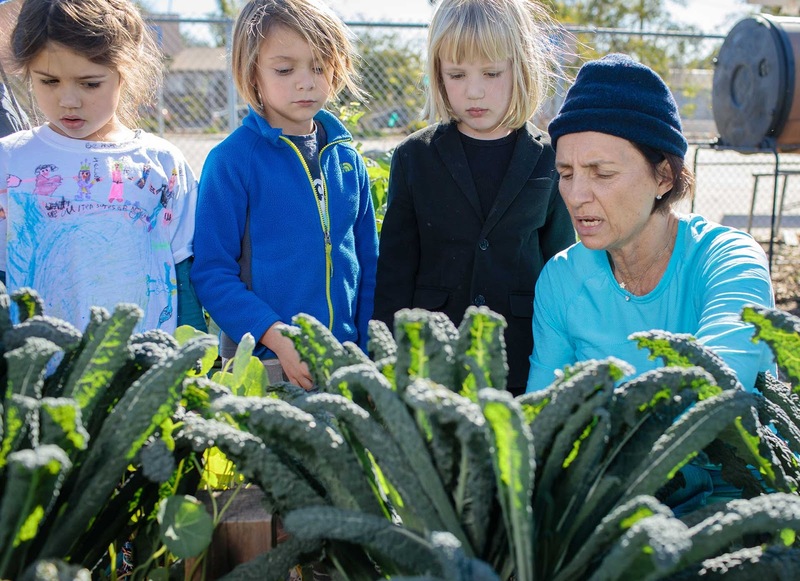 In the edible garden, students work weekly with Master Gardener Daniela Roveda and local environmentalist Jeanne Kuntz engaging in seed-to-table learning. This unique program includes classroom instruction on the life cycle of plants, plant anatomy, the role of pollinators, and the needs of plants (air, water, soil nutrients and seasonal preferences). In addition to horticultural science, the students learn weights and measures (metric and US), geography, climate and the concept of variables in any scientific experiment. 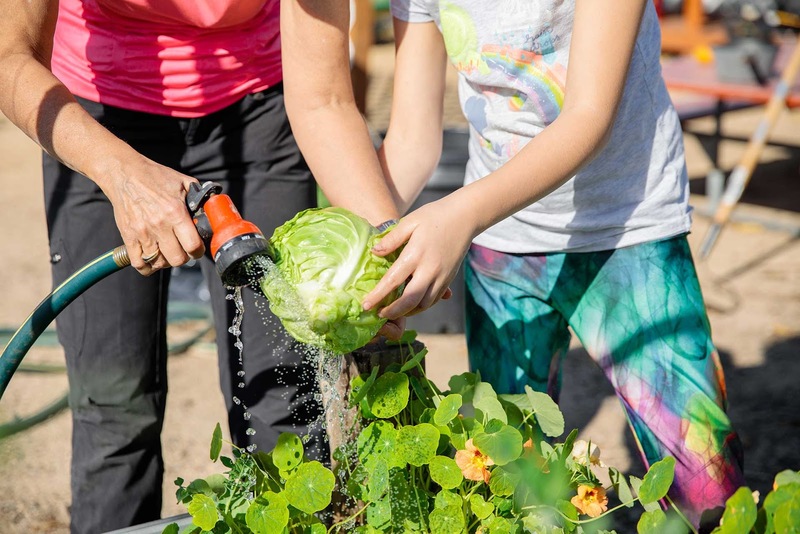 Hands-on learning in the garden includes growing plants from seeds, transplanting, cultivation, harvest, safety (bees and tools) and cooperation. The students also sample the produce. This runs the gamut from sharing freshly picked radishes in the garden to sautéing garlic and kale. With very few exceptions, the students enjoy the healthy snacks and, thereby, establish a lifelong appreciation of healthy eating. BFFs in the Walgrove Wildlands! In the Walgrove Wildlands, students have the opportunity to become stewards of their environment by engaging directly with nature. 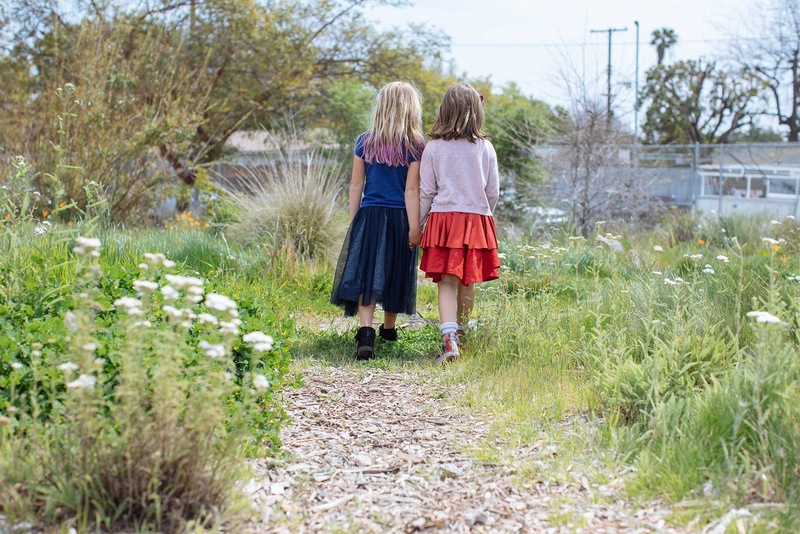 This urban eco-lab is designed for on-campus curriculum-based science education including lessons about native plants and animal species, ecosystems, watershed issues and more. It also facilitates the practice of council and a myriad of outdoor projects that promote learning and discovery. It even hosts theater performance and functions as an art space! 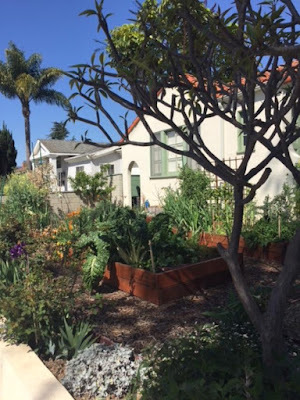 To celebrate the Mar Vista Green Garden Showcase, Walgrove Elementary is hosting a free community gathering called Monarch Fest from 12-4pm celebrating the myriad outdoor education spaces. Activities include kids’ yoga, live music, nature mandala sculpture building, food, and special performances by Walgrove’s own Musical Theater and Strings by the Sea violin program. 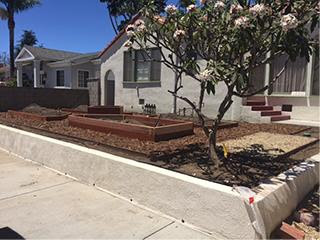 The edible garden boxes were gifts of the Walgrove community, including volunteers, teachers, students, neighbors, and families and were constructed in 2016 by Walgrove families. 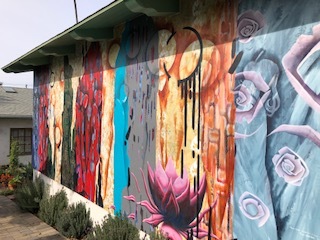 The orchard was founded by formerly co-located Ocean Charter in the early 2000’s, increased to its current size in 2016, and includes citrus and fruit trees as well as providing shade and creative possibilities for students on hot LA days. 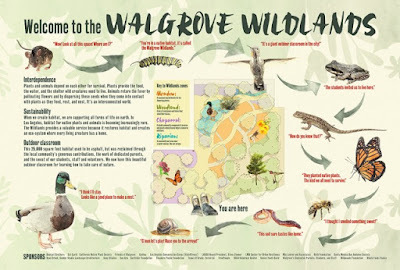 The Walgrove Wildlands was conceived and constructed by parents, staff, students and volunteers from throughout Los Angeles. They work with the LAUSD, Enrich LA, S.M. Bay Audubon Society, Whole Foods, Loyola Marymount's CURes program, Common Vision, Surfrider Foundation, Million TreesLA, Kids4Trees, Theodore Payne Native Plant Foundation, CA Native Plant Society, Venice YouthBuild and volunteer groups from UCLA, Pepperdine and Santa Monica College, just to name a few of their many partners and supporters. We owe possibly the largest debt of gratitude to our landscape architect, Ryan Drnek of Sodder Studio. NOTE: entrance gate is on Appleton Way at Redwood Ave. 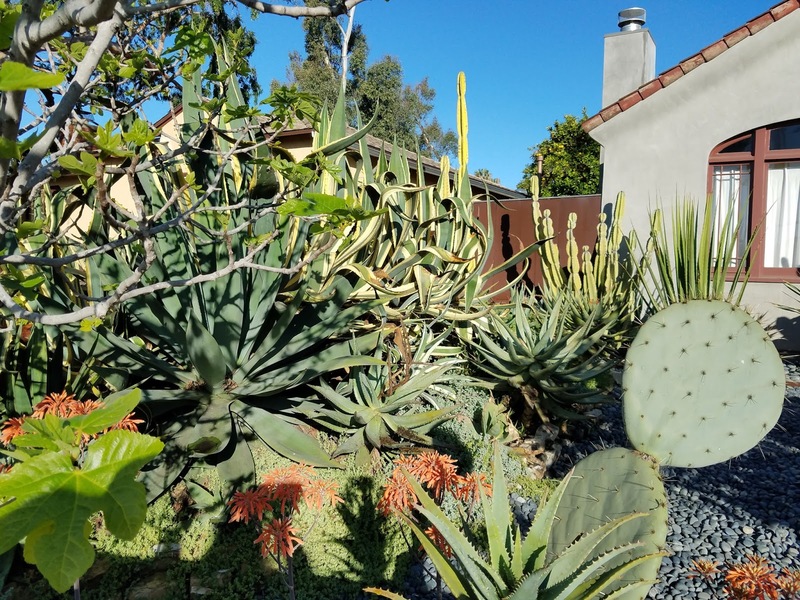 I am so excited to be Chair of the revitalized Mar Vista Green Garden Showcase for 2018 and hope you will visit my garden (front and back are open). Reps from the LADWP will also have a table talking about all the great rebates that are available through the city (cash for turf, irrigation, free trees, etc.). 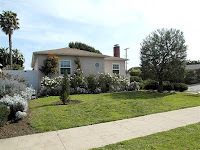 As you can see from the "before" shot, when I bought the house in 2013, it had a boring lawn, some roses here and there with no beds, pavers, shrubs or drought-tolerant plantings. That blank slate was great in many ways as I could create my own vision. But it also produced in me a horrible period of paralysis. I didn't know what to do and felt overwhelmed. Here's my biggest tip if you find yourself in a similar situation: PINTEREST ROCKS!!! I just devoured hundreds of images of sustainable gardens and pared down what might work for me. And I recalled many of the gardens I had visited on previous Mar Vista Garden Showcases. 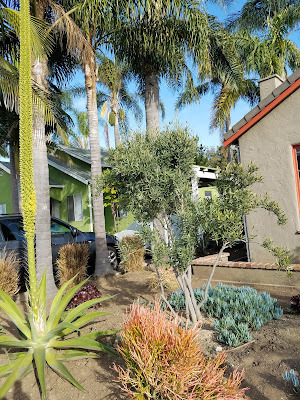 I was so lucky that a wonderful landscape designer named Michael Todoran lives in my neighborhood and I hired him to create the actual plan for my front garden. 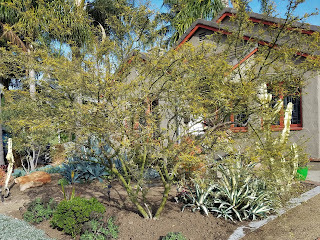 Then my longtime gardener Henriis Caballero took over and did the plantings, created the porous fence, installed the drip irrigation system and hopseed perimeter, and laid down the decomposed granite walkways. 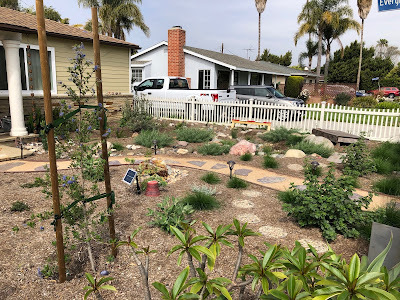 The front yard's half-moon pathway separates beds of echium (Pride of Madeira), society garlic, various sages, butterfly bush, night-blooming iris, milkweed, and Eastern redbud, olive and Jacaranda trees. 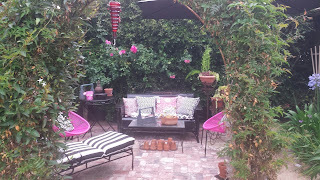 My sustainable garden dream came true with lots of help...I wish the same for you. 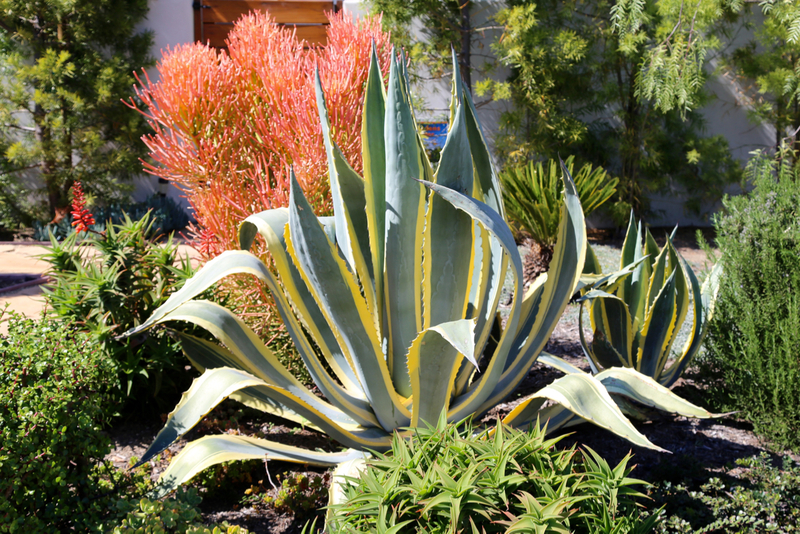 Our garden is a mixture of a variety of agave, aloes and fruit trees and it is truly drought tolerant. We first planted fruit trees in 1997 and while remodeling in 2010 we removed all the grass and that's when the fruit trees really flourished. We created a recycled limestone stone wall, steel garden borders and planter boxes, and a "river" of river rocks that greets you at the entrance and leads you throughout the property. 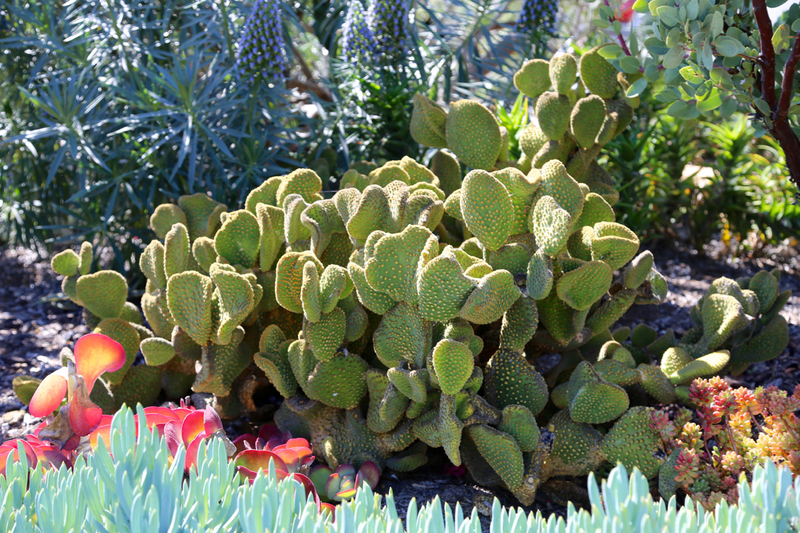 Many of our succulents started out as cuttings and have been collected over time from friends and trips to other desert climates. Through the years we have grown vegetables and seasonal flowers, but our love of succulents and our busy schedules have shaped what you see today. We enjoy ruby red grapefruits, lemons, figs, blackberries, and peaches at different times throughout the year. The birds, butterflies and lizards are the biggest benefactors of the garden and we have seen a huge increase in all of them over time. We love to pick our dinner from the garden and show off our night-flowering cacti. We love living here and have seen a lot of changes since we arrived in 1995. 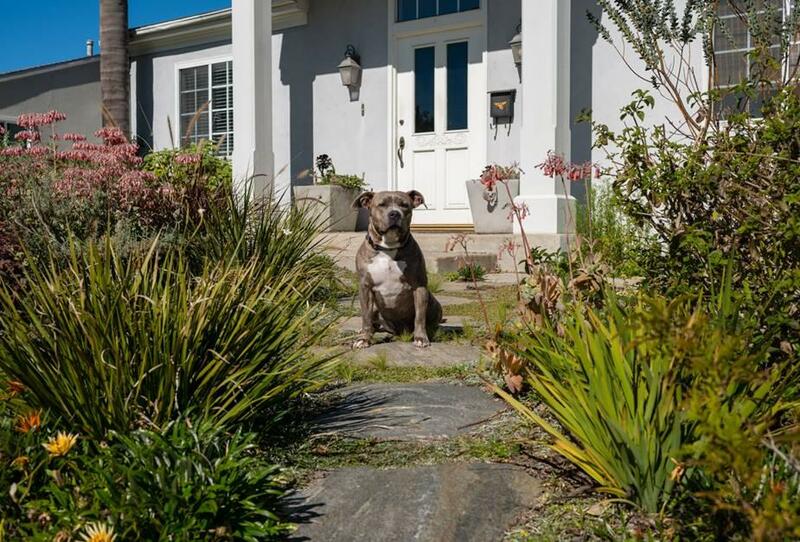 Several years ago, we decided to get rid of our lawn and put in sustainable plants, purchased in Moreno Valley at Adam Hall's Nursery. We added a pathway up to our home through our new garden and love the colors and textures of our yard. 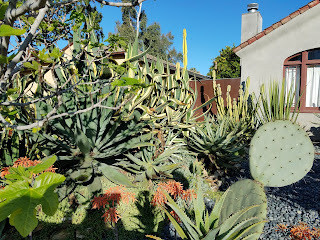 The front garden is comprised of succulents and two wonderful trees, an olive and a Palo Verde, instantly recognizable by its gorgeous green trunk. Additionally, we built a small berm and added large scale rocks for added interest. The recent rains have led to an explosion of some of our bigger cacti, some of which are taking on other-worldly dimensions. While most things have come in beautifully, we have had some frustration with our persnickety dymondia. It continues to be a challenge by refusing to fill in the parkway area fully, but we are letting it come in at its own pace. That's part of the fun of having a sustainable garden, isn't it -- working with a garden's evolution and developing patience to see where the garden wants to take us. We look forward to seeing what else might happen in our garden in the coming weeks. This is our drought-tolerant turf replacement project. We added a flagstone walkway to the front door, with an open area to enjoy our morning cup of coffee. 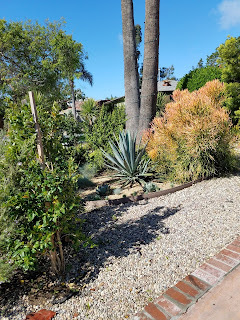 We replaced the sprinkler system on the main part of the yard with drip irrigation, and plan to do the same to the parkway and driveway strip when time and budget allow. We irrigate once a week, when necessary. We use wood chip mulch to retain moisture and provide nutrients, and we apply compost tea seasonally. Our garden is designed to attract monarch butterflies, bees, and hummingbirds and provides some of our favorite foods and herbs. Colors are chosen to suggest the iconic California sunsets. 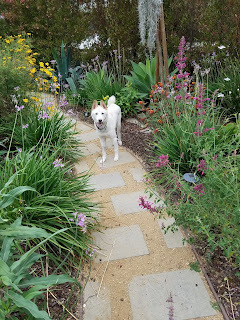 Our 3-year old garden is a work-in-progress, as we discover which plants do well and which do not, and as we take inspiration from neighboring gardens during our morning and evening dog walks. We are delighted to share our gardening journey with our neighbors, many of whom have taken the time to stop and chat, appreciating our contribution to the neighborhood. A large vegetable garden was something we had dreamt of having for some time. We began visualizing what we wanted in our yard and garden about five years ago which was such a delightful process. 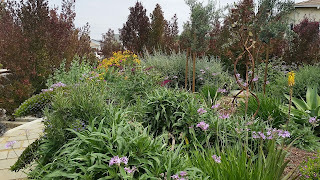 Books, magazines, trips to various nurseries and attending local garden tours provided plenty of inspiration. Keeping clippings from magazines of things we liked and taking photos when someone else's garden delighted us helped solidify our ideas. John Tikotsky and Associates was our landscape architect and R&R Landscape Services was our contractor. Both firms did incredible work. John is gem. We wanted to be urban farmers and reduce our impact on the earth at the same time. We removed all but a sliver of grass in the front and back yards, converting to a drip irrigation system, installing a smart watering system that adjusts to seasonal temperature changes and planting low to medium-low water usage plants. 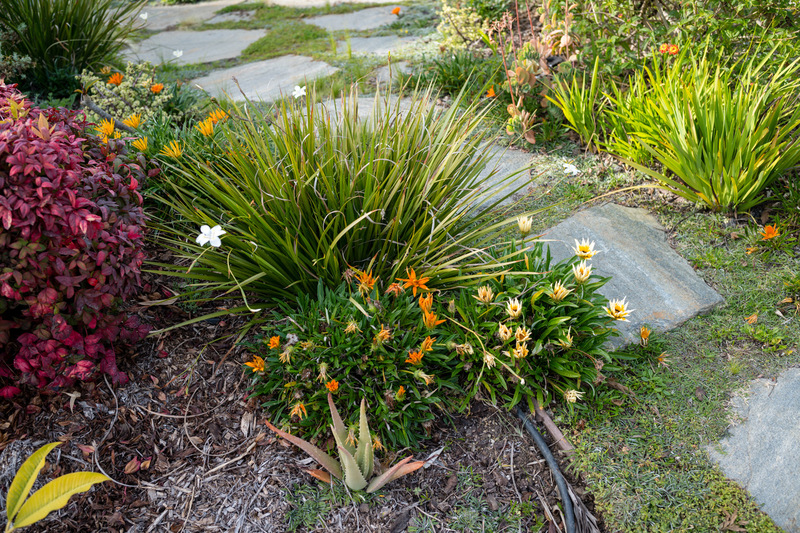 We minimized water loss by using mulch, which also eventually breaks down and enriches the soil. Two years ago our basic design was completed and we began planting seasonal vegetables, berries and herbs. This reduced our carbon footprint even more, because rather than a trip to the store to buy vegetables, we simply walked to the front yard. The next year we added blueberry bushes and fruit trees. Every year we work on a new section of the garden. 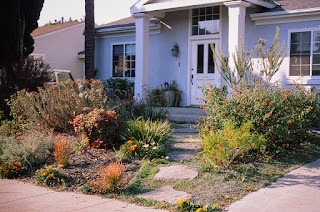 This year we are planning to add low water and native plants around the perimeter of the front garden and get rain barrels. 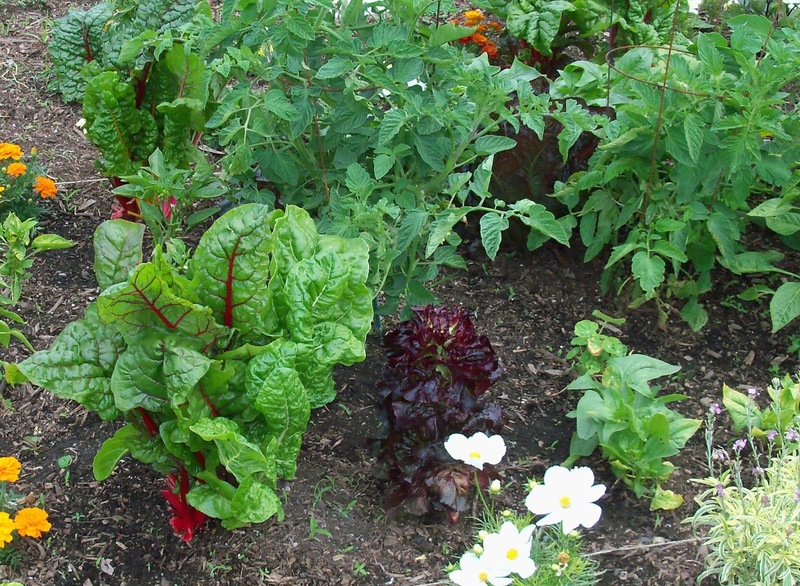 We maintain a completely organic gardening system. Soil is enriched with compost we make from yard clippings and kitchen scraps. We also recycle kitchen waste in our worm bin. The resulting worm castings are an incredible garden soil food. Our focus is on growing healthy soil with the faith that healthy plants will follow. Each season we learn something new from the garden and discover new varieties to try. Our garden provides us with tremendous joy and bounty! GET THE INSIDE SCOOP ON A BRAND NEW GARDEN. See how the site plan was devised, what plants were selected and how the garden owners worked with experts on every choice to make their sustainable garden dream come true. This is a not-to-be-missed opportunity to see sustainable garden design and execution. Hi MVGGS visitors, we're Julia and Zach and six-year-old Roman, all of whom love gardens. We have lived in the Mar Vista neighborhood for 10 years and bought a home here six years ago. It had a sweet English garden look when we bought it with a big green lawn and a white picket fence. 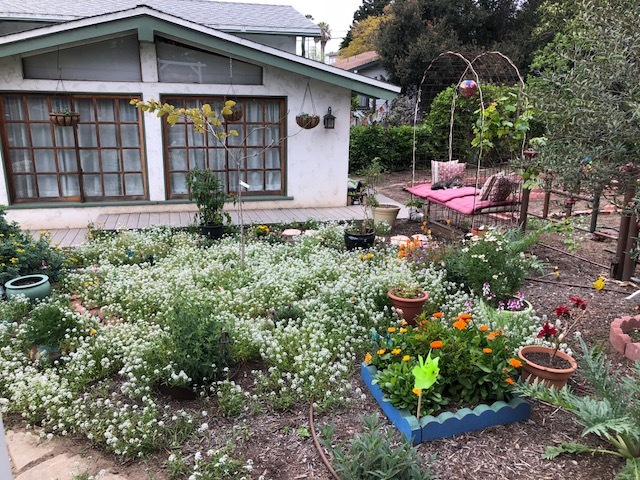 A few years ago we decided to let our lawn go and stopped watering it with dreams of transforming it into a water-wise garden. Our brown lawn was dreary and we knew that it was time to do something about it. 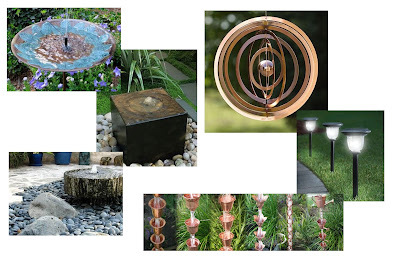 Julia began a vision board of ocean-friendly landscapes and created a Pinterest garden board. 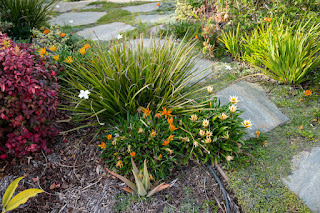 Recently, our front yard was selected as the home makeover for UCLA’s Extension Landscape Architecture course “Building a Garden Ecology with California Natives," taught by UCLA Ecology Professor Alison Lipman, director of environmental non-profit SELVA International, and Steve Williams of Surfrider Ocean Friendly Gardens and Selva EcoGardens. Steve also works as a conservation biologist at Resource Conservation District of the Santa Monica Mountains. 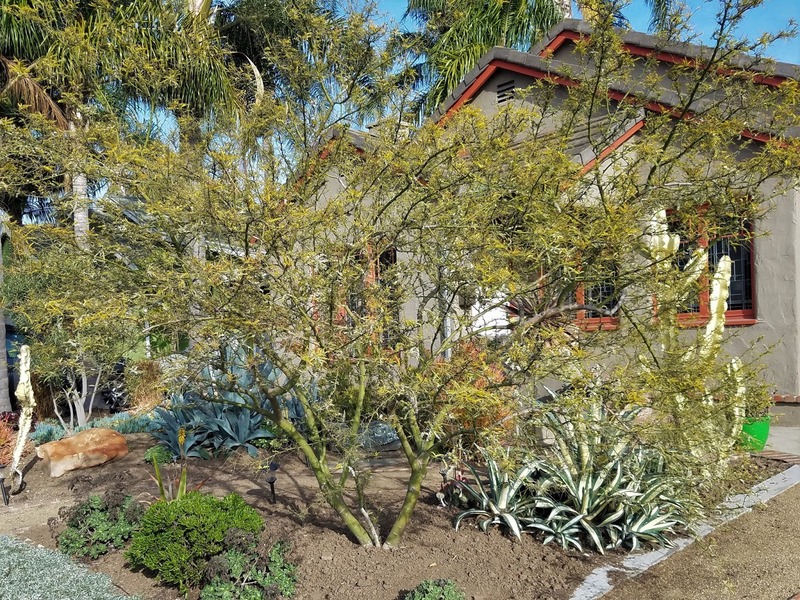 The challenge was to transform a relatively small front yard into an ocean-friendly CA native garden which also allows space for play and relaxation. 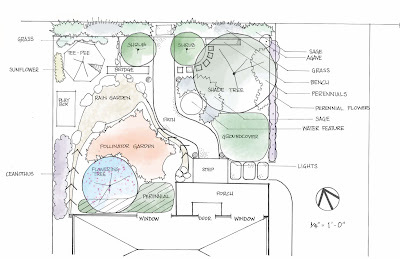 We chose a drought-tolerant so cal native zen playscape from the concepts submitted by 25 students. 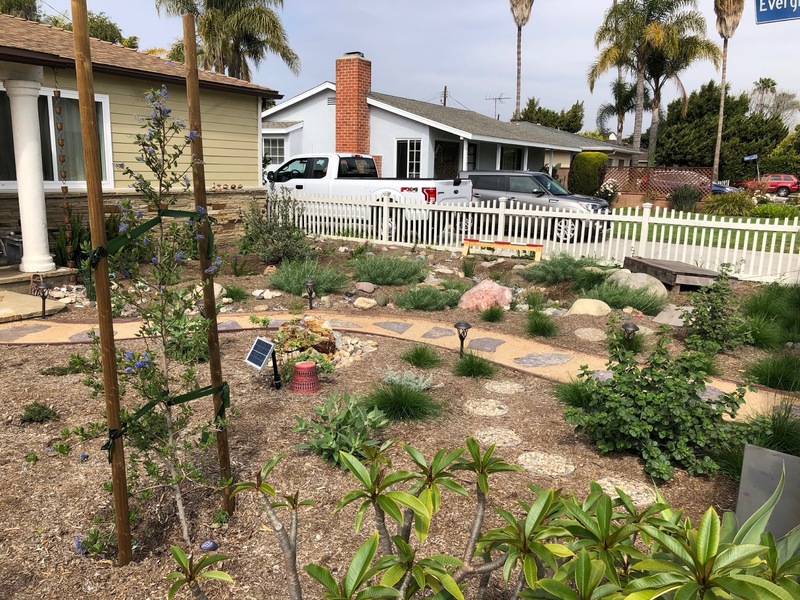 The team of students removed all grass and existing plants and replaced all that with a rain garden, pollinator garden, natural playscape and gorgeous all so cal native plants. When we couldn't find the perfect water feature Zach designed a gorgeous fountain out of a perfect boulder and made a solar fountain in an afternoon. We also added big colorful boulders around the rain garden for our son to play on. 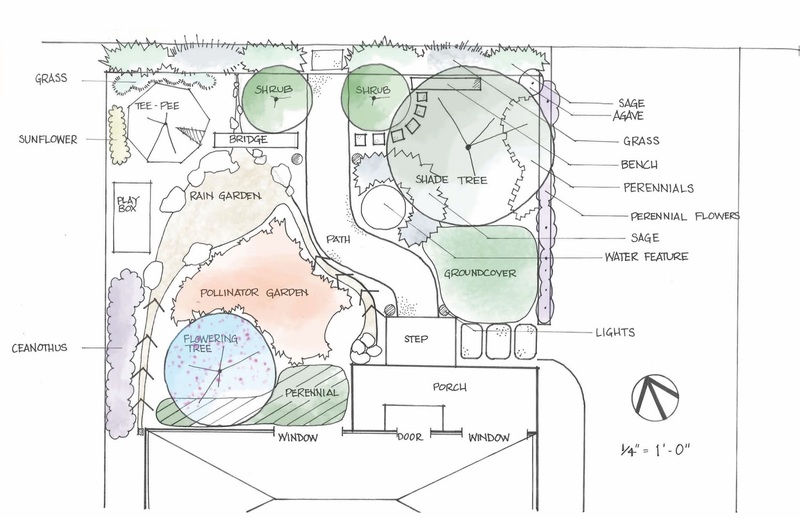 We have plans to put in a zip line and nature-inspired climbing structure for our son's play corner. 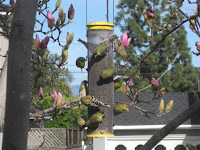 So far, the yard has been attracting all kinds of birds, bees, and butterflies! The garden was installed last December so is only four months old. 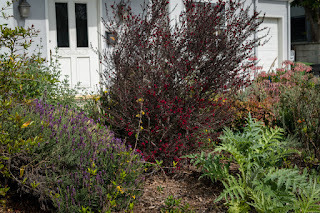 The plants are still growing their roots now so are still small above ground, but we think it is important to highlight that establishment of a native garden requires a little patience. The plants establish best from 1-gallon containers. 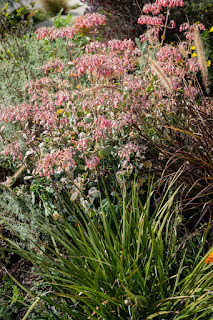 A popular saying about native gardens is, "The first year they sleep, the second they creep, and the third they leap!" Steve Williams will be with us in the garden with info about Selva EcoGardens and Surfrider Ocean Friendly Gardens! We will have free low flow shower heads and sink aerators from LADWP for folks in their service area. Come see what you can do with an old garden...and learn from a local naturalist! 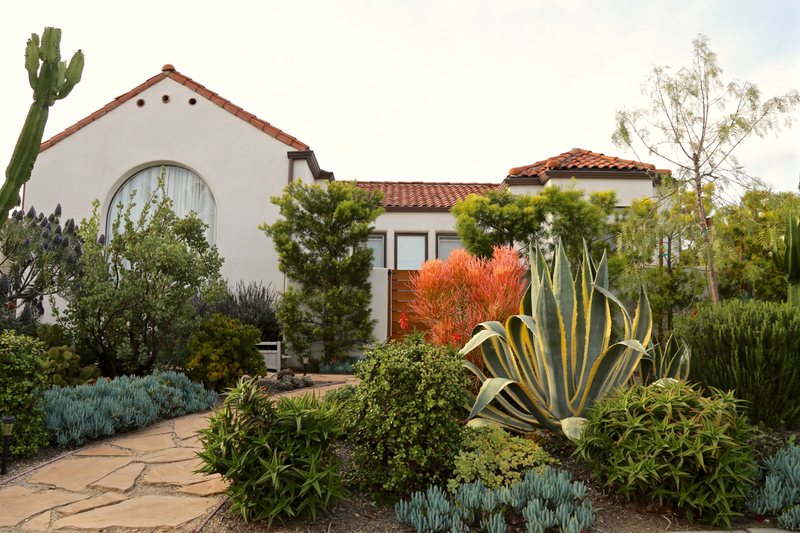 Over the past three years, since the 2015 garden tour, this "California Garden" has been evolving. Come see what’s changed and what’s stayed the same. 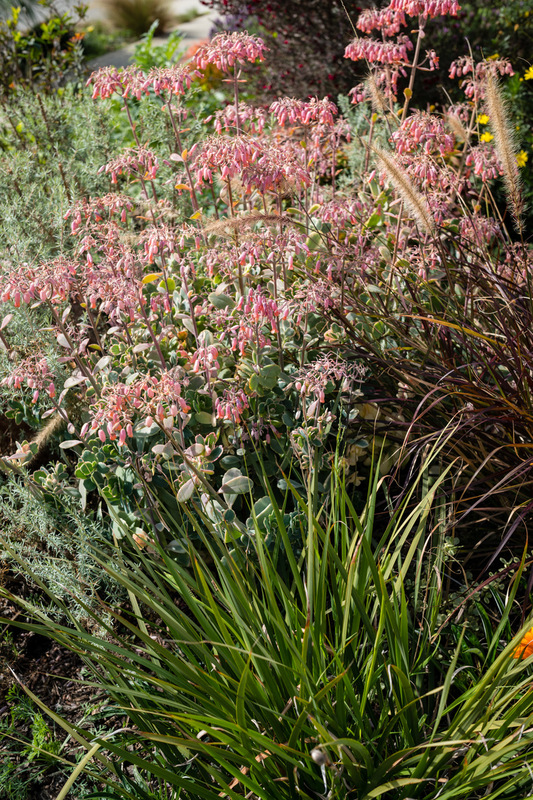 Gardens are dynamic, the challenge for owners is to be aware of what’s happening, and sometimes, just go with it. This garden is a mix of new California natives and some non-native plants introduced years ago by the original owners. 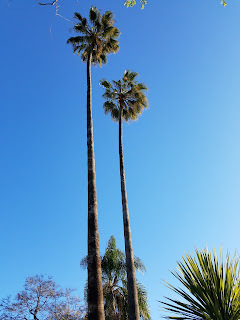 One of the oldest California Avocado trees in the neighborhood is in their backyard. It has its own set of challenges and they've landscaped around it accordingly. The garden is hand-watered and includes rain barrels and a rain garden. 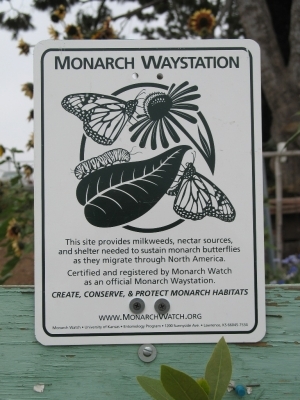 It is a Certified Wildlife Habitat, Xerces Pollinator Habitat and Monarch Waystation. Garden. They are welcome! 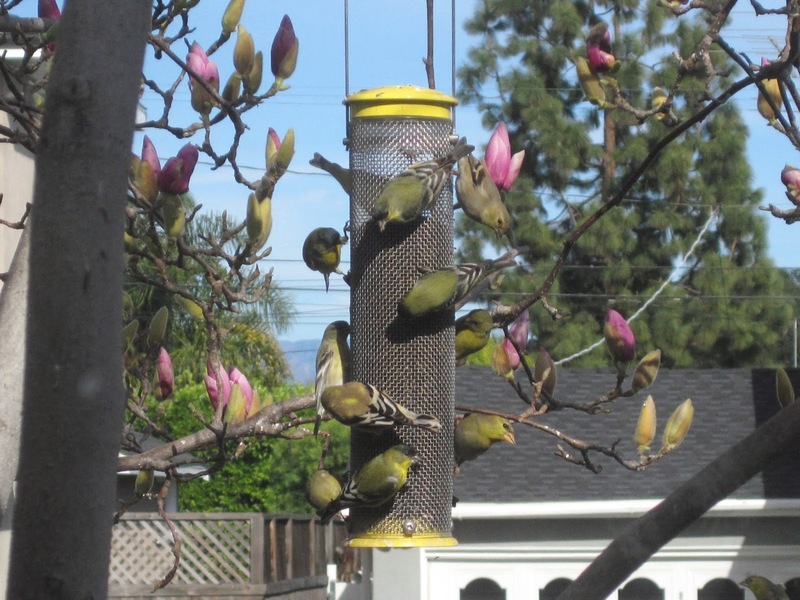 This is the Year of the Bird, as designated by National Geographic Society and their partners the Cornell Lab of Ornithology, National Audubon Society, and BirdLife International. One of the garden owners is the former Executive Director of the Friends of Ballona Wetlands as well as a landscape designer (Giardino della Vita). She is now the Dan and Susan Gottlieb Environmental Leadership Fellow in the Center for Urban Resilience (CURes) at Loyola Marymount University. 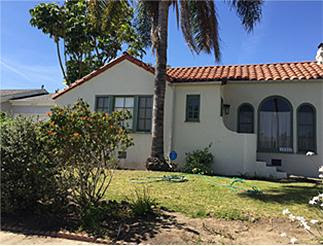 Don’t miss this Mar Vista treasure! Come for the compost tips, stay to tour the gardens! Visit Ocean View Farms between 10am and 1pm for a tutorial on composting from OVF’s resident compost guru Karl Lisovsky. One of OVF’s most important long-term commitments is to continually increase its awareness of, and participation in, our neighboring community. 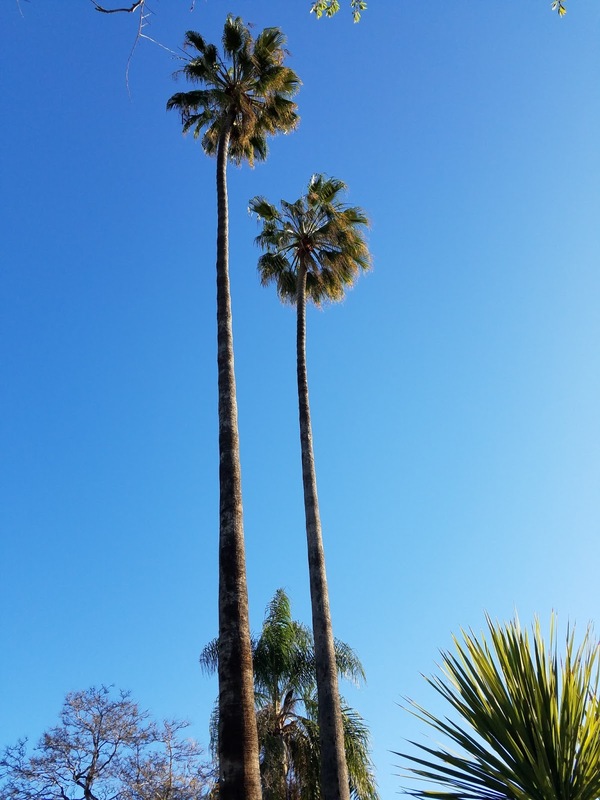 One example of this synergy is a cooperative effort with the City of Los Angeles to reclaim and reuse city-collected stable waste in conjunction with a vigorous internal composting program. Today, OVF's composting program entails mixing reclaimed stable waste with the green organic waste produced in the garden. Last year, over 200 tons of shredded soft green waste, 900 cubic yards of woody material and 80 tons of stable waste were combined to produce a virtually unlimited supply of compost for plots. Mar Vista Green Garden Showcase visitors are invited to bring home some compost from OVF’s supply. 500+ garden plots overflow with organic veggies, flowers and fruit, all organically grown. From artichokes to agave, OVF has it all. This season gardeners are planting tomatoes, corn, beans, squash, potatoes, chard, lettuces, and onions. 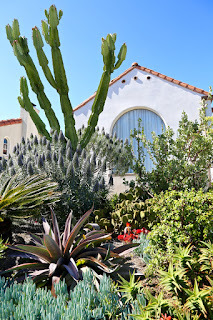 Several gardeners have cactus and native plants, and the perimeter of the garden is filled with fig, avocado and citrus trees, as well as pine, eucalyptus, black walnut and palm trees. Organic Gardening Magazine donated a 1,100 gallon cistern to OVF and it sits at the top of the hill (at the far end of the parking lot) and is connected to one of the dugouts near the Little League baseball field. Just one rainy day collects over 600 gallons of water! The water is piped down to the composting area to be used on the pile. 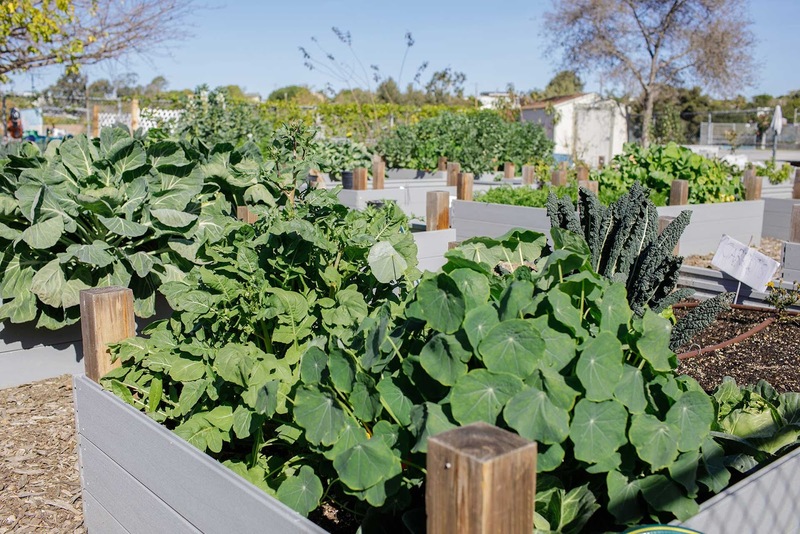 Ocean View Farms is on six acres of land owned by the DWP and under the jurisdiction of the Department of Recreation and Parks and is the largest of more than 60 community gardens in Los Angeles County. One year ago most of this front yard was a concrete driveway (1400 sq.ft.) and now it's transformed into a two car garage surrounded by eclectic, self-seeding, drought tolerant and drought resistant gardens (1200 sq. 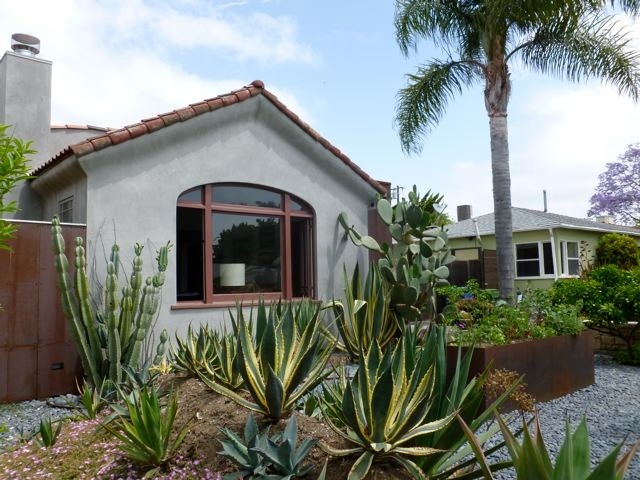 ft.) utilizing lots of repurposed pots, bricks and broken cement materials throughout. Pinwheels and Nepalese flags add color and movement to the environment. 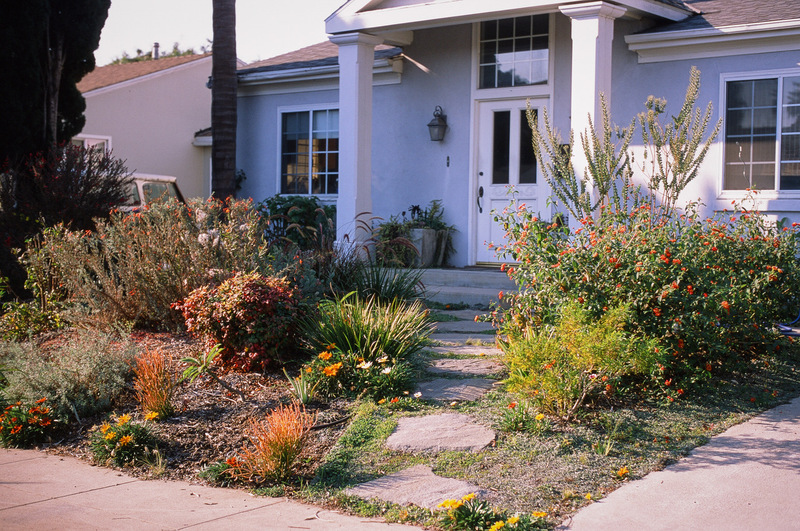 I use a Do-It-Yourself approach and improve the yards as time, budget and energy permits. I built a small retaining wall in the front to address the slope of the yard and used broken concrete creates pathways throughout the property. 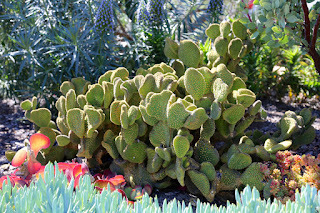 Many plants and flowers were started from free seed packets and seedlings from the Master Gardeners at the Mar Vista Farmers Market or from 99 cent store plants. Neighbors contributed mulberry saplings to my endeavors. 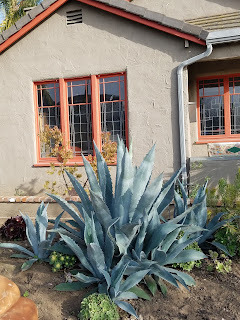 Large agave, some fruit trees, grape vines, and artichokes were transplanted from other parts of the property. Shade trees (some from City Trees), flowers, fruit trees, herbs, vegetables and vining plants invite lots of bees, birds and butterflies. Monarch butterflies frequent my milkweed plants. A layer of mulch (supplied by the City) keeps the soil moist. Water efficient drip irrigation is monitored by a Rachio Irrigation controller, accessible by my smartphone. There's also a beautiful mural on the side of the garage by local artist, Gus Harper.